Plot. Income: 4. Initiative: 5. Claim: 1. Reserve: 6. Plot deck limit: 2. 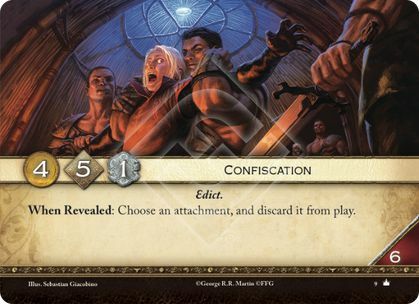 When Revealed: Choose an attachment, and discard it from play. "When revealed" effects on plots must resolve when the plot is revealed (RRG, p. 23). You have no choice. It triggers whether the person revealing the plot wants it to or not. Since the text of Confiscation doesn't place any limits on the target attachment, when you get to the point of choosing targets, yours are fair game, too. Since you must choose a target, like it or not, after the ability triggers, if the only attachments on the board are yours, this plot will force you to discard one of your own attachments.